USB 3.0 is the fastest USB connection available. With speeds of up to 5Gb/s, USB 3.0 is 10 times faster than USB 2.0 (480Mb/s)! Store HD movies, archive precious photos, and back up an entire music library in seconds. 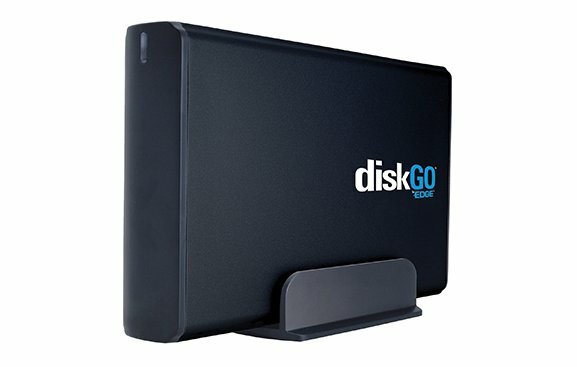 Simply connect the diskGO External USB 3.0 Hard Drive to an available USB 3.0 port of a computer to begin backing up data in ultra-fast transfer speeds. No software is needed to download or install. USB 3.0 is backwards compatible with USB 2.0 devices, which means it can also be used with older systems. Both PC and Mac compatible, the diskGO External USB 3.0 Hard Drive is an excellent cross-platform storage solution. Everything needed to get started is included: USB 3.0 cable, power adapter, and a versatile mounting stand for freeing up valuable desk space. The sleek black aluminum casing provides cooling and durability. Protect precious data from accidental loss and assist with disaster recovery with the diskGO External USB 3.0 Hard Drive. Fast – SuperSpeed USB 3.0 allows for transfer rates up to 10 times faster than USB 2.0 (when connected to a USB 3.0 port). The fastest USB technology available—achieve rapid data transfer rates in a low power, efficient manner. Easy to Use – Simply plug into an available USB port to start backing up data. No software needed to install. 1. How do I store and access files from my DiskGO hard drive using Windows? 2. How do I store and access files from my DiskGO hard drive using a Mac? 3. How do I format the DiskGO hard drive for use with a Mac? 5) Next to Format, click the dropdown and select Mac OS Extended (Journaled) if you intend to use this device ONLY in a Mac environment. If you wish to use this device in both Windows and Mac environments, select MS-DOS (FAT). NOTE: If you choose to format as FAT, you will be unable to store individual files of 4GB or larger on the DiskGO hard drive. 4. What operating systems support DiskGO hard drives? 5. I get an error when I disconnect my DiskGO hard drive from a Mac. Why does this happen? 6. In Windows, what is the proper way to disconnect my DiskGO hard drive after I have finished using? The DiskGO hard drive is supported by Windows XP and higher. To disconnect, simply unplug the USB cable when the drive is not active (when the activity light is not blinking). 1. How do I utilize USB 3.0 speeds?